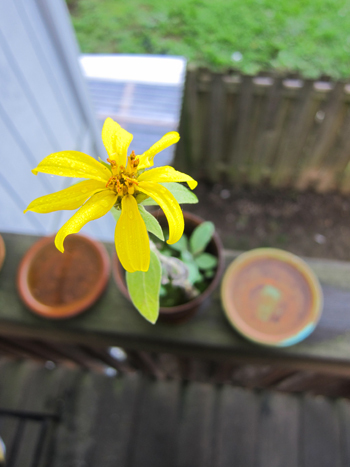 This random zinnia popped up in an unused pot. Aww, little fighter! 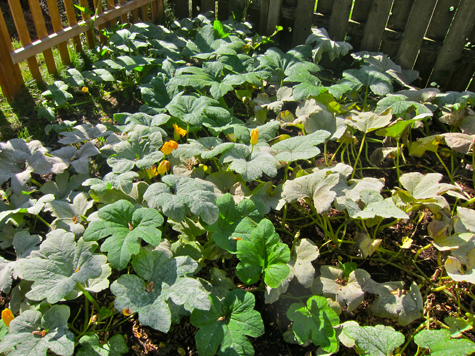 By late summer the gourds were dominating the whole yard, while the rest of the garden was also going strong! This guy was our Hallowe’en pumpkin! So cool to grow our own this year. 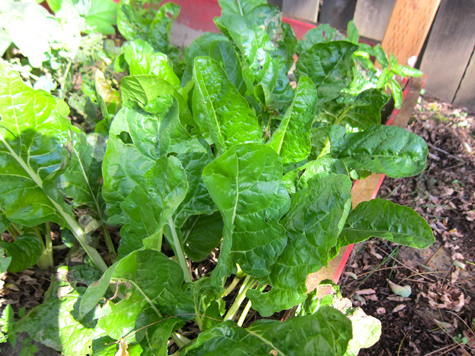 The Swiss chard was beautiful, but never got very big. 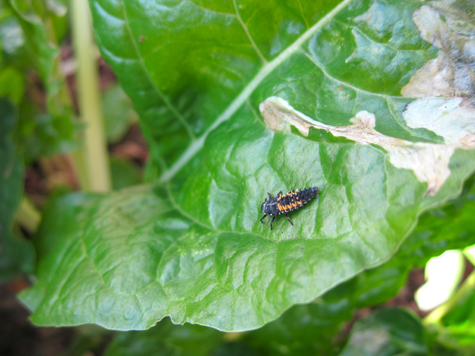 Ladybug larvae keeps my greenery safe from pests! 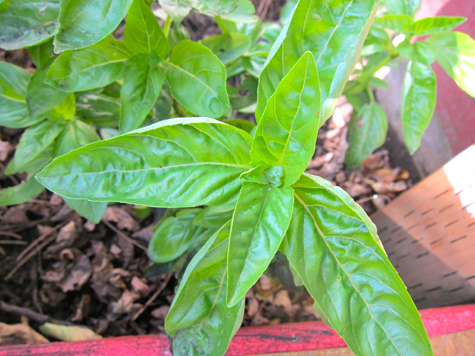 Basil, also beautiful but also not very big . . . The tomatoes exploded with lots of foliage, but very little fruit. 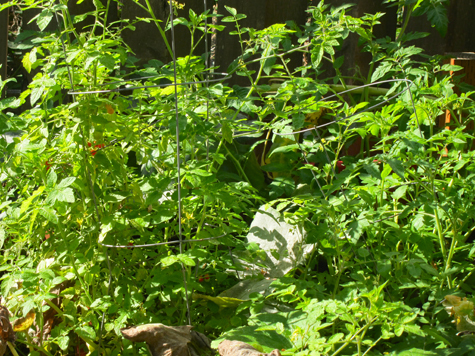 It was the same story all over Portland – a bad year for ‘matoes. I sure did shed a tear. The haul. I got another handful like this, and that was it. 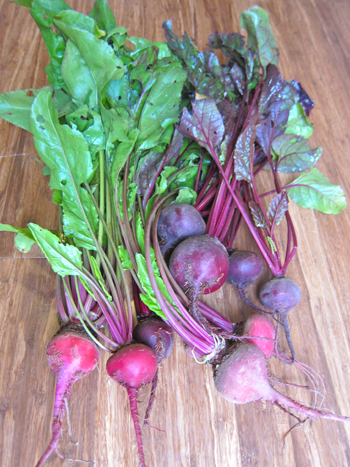 Beet bounty! Be still my heart and stain my fingers! Meanwhile, up on the herb deck . . . This huge parsley pot went into a big batch of soup stock right before the first frost. 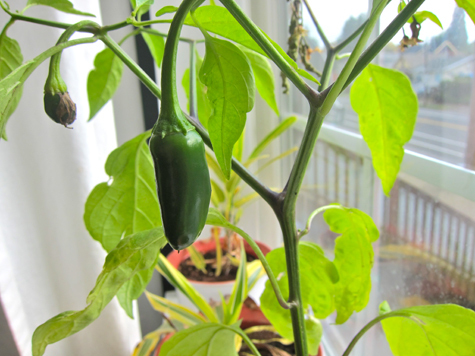 I planted these jalapenos waaaay late in the season, on a whim. I didn’t even think they’d sprout! Well they did sprout . . . and they grew up big . 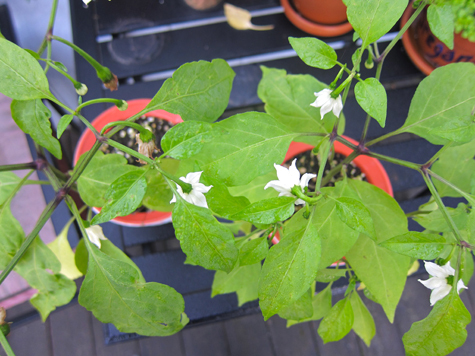 . . and then in some late autumn sun, they flowered! That presented a quandry . . .
With healthy herbs and peppers about to fruit, I was facing first frost. I decided to take a chance and transport parts of my garden into the house! Suddenly the sunny windowsills where I sprout my seeds took on a whole new purpose. 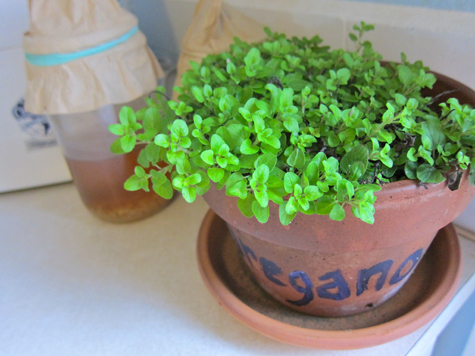 Oregano’s new home on the kitchen counter (spot my ferments in the background! 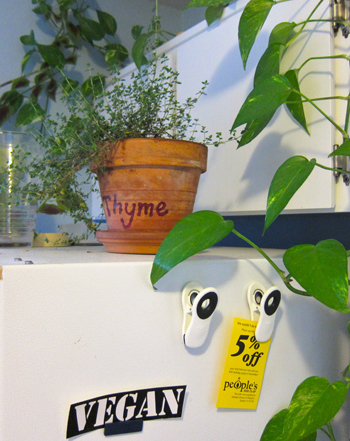 Thyme hangs out atop the fridge. And finally, I dug up all my basil and transplanted it into pots. It worked! A month later and it’s actually survived! 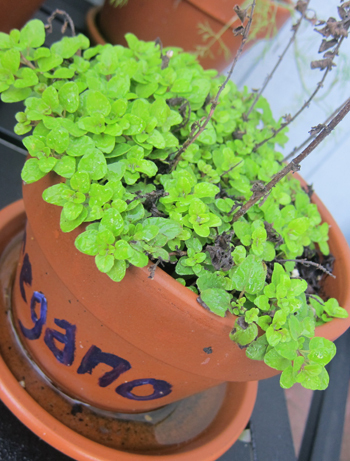 I’m really loving the indoor gardening and plan to keep it up through winter – maybe even expand! Have you ever experimented with indoor/off-season growing? And how did your garden go this year? 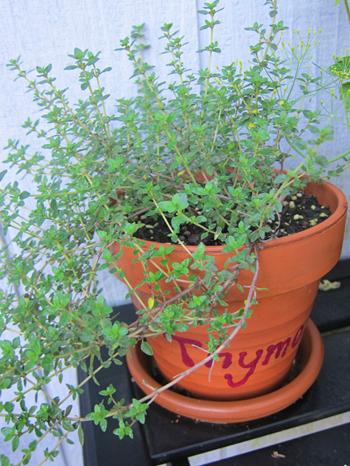 I think my favorite thing about living in the South is that my herb garden survives the winter months! We definitely let the ground rest during this season, cover crops are going strong and I’m frantically drawing up plans for 2011 gardens in time to order seeds. My bok choy bloomed last weekend, the night before we got snow! I need to get some pictures up on my site. Oh! that picture of the squash blossom got me salivating, they are delicious in a quesadilla. Sadly, the apartment I just moved to has no room for a garden, plus it’s already getting really cold, so I only have a small basil plant and two bean sprouts. Oh, I just remembered you can also make whistles out of squash blossom. We had sad tomatoes, but our salad greens were amazing! Also, lots of pumpkins, and tigger melons, and beets. onward to next summer! oops, almost forgot – - we are starting our alfalfa bale beds now, so that they cook and compost during the winter, ready to plant in spring. We had a really rough season with tomatoes down here in southern Oregon too. I thought it was just me and planting late but a lot of folks had very small tomato yields. *shrug. Weird. I live in Australia and my last crop of tomatoes also went a little odd. Most of them just refused to turn red. So my best female friends and I had a ‘southern belles’ party and ate a lot of fried green tomatoes, made green tomato relish, drank mint juleps and laughed at each others ridiculous (Australian) attempts of southern accents. When life hands you lemons, make lemonade. When life hands you green tomatoes, have a southern belle party! If your herbs don’t survive in the windows, you can always pick them and store them in ziplock bags the freezer. It’s still not a good as just picked, but the defrost pretty nicely and you can add them cooking foods still frozen and they defrost in seconds. 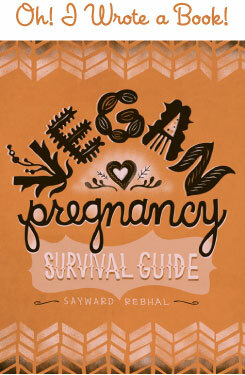 My husband and I are finally renting a house, so I’m looking forward to starting a garden in 2011. I’ve tried indoor gardening, but we have cats; cats and plants don’t seem to mix. Maybe I need to install shelves in a sunny place? Our tomatoes over here on the East coast were also sad. 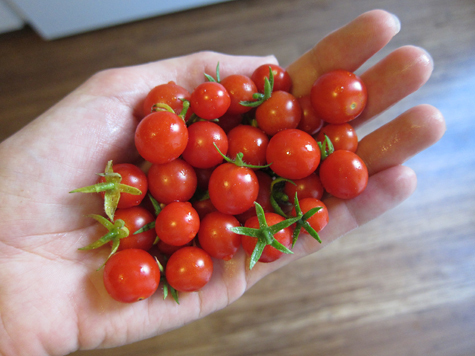 My plants were big and healthy and came up pretty quick, but I didn’t get any ripe ones until very late, and they were extremely thick skinned and slightly unpleasant to eat. I got maybe two handfuls and some stragglers. We only did tomatoes and herbs this year, so that was a bit disappointing, but the herbs were very nice! Next year I’m going to try and grow my own pumpkins, we had our first garden this summer and managed potatoes, onions, strawberries and herbs. Next year we’re adding pumpkins, cucumbers, rhubarb and whatever else I can get in the ground. 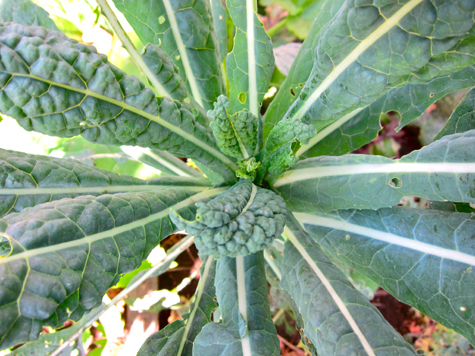 The best thing that happened in our garden was an accident! We have a community garden behind our house, so in addition to planting our backyard garden, I planted a few things in the community garden too. 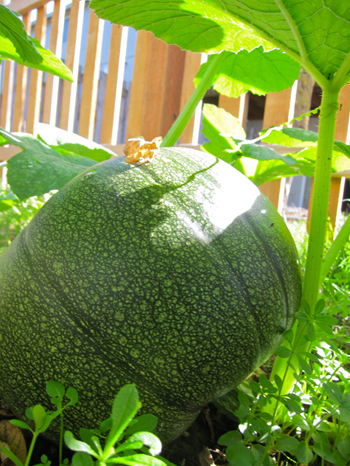 I used my compost to spread over the dirt and much to my amusement, I got these tiny orange tomatoes that I’d never even seen before, and I also got this enormous squash plant that no one could identify, even when it fruited, we couldn’t figure out what it was! It was good though! 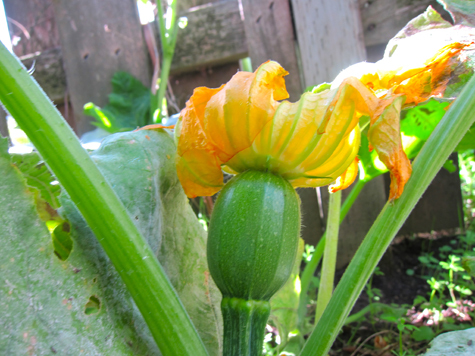 That’s what I get for not separating out my seeds from the compost! @ Annie – I always love your stories and the Southern Belle party sounds SO awesome. Way to spin it positive! This was my third year gardening, and by far my most successful. Not so much because of the fruit I harvested, but because I managed to keep most of the plants alive all summer! My rosemary and basil both danced at the brink of death several times but were still going strong when I closed up shop a few weeks ago. 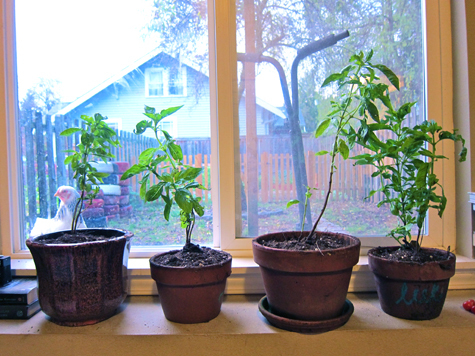 I grew all my herbs in pots this year so I brought them inside before the first frost. My tomatoes were OK; I accidently bought 8 plants (instead of only 3 like I thought) so I wound up with more than enough. Considering how many plants I had the amount of fruit wasn’t too spectacular, but they tasted amazing though. I can’t wait until next year, I’ve got even bigger plans! i love the chicken in the photo! I agree that it’s great to have herbs available every season! But in case you don’t feel up to hauling them in next year I know for a fact that your oregano will be just fine over winter and will come back in full force in the spring. 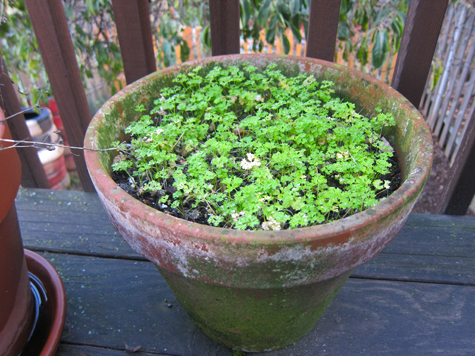 Parsley will also come back bigger and better and often Thyme stays green all winter (mine is still good even under the snow!) Basil gets a little weedy inside and if you hauled your rosemary in be sure to spray it with a spray bottle to keep the leaves nice and plump. 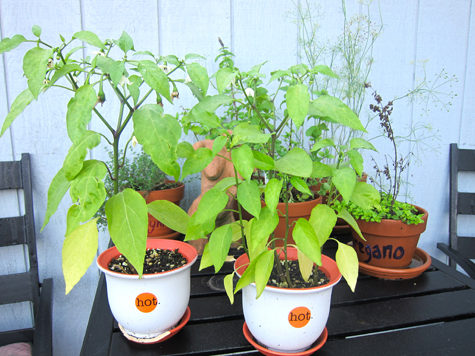 What a clever idea to haul your pepper plants in! I wish I had thought to do that. 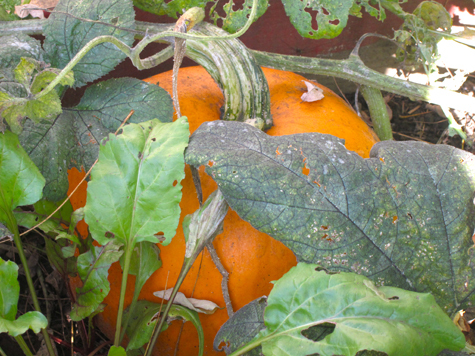 Ours didn’t really start to produce till the end of fall, by then it was too late!